So, I may or may not have mentioned on this blog before that I hate carrots. Now, since I like to pretend I’m grown up, I can now stomach them a little better when I have to and don’t go running from the room gagging – as long as they meet certain criteria: not overly mushy when cooked, aren’t the star of the show (no, I will not eat carrot soup), or are shredded on a salad. But do I like them? No, not particularly. However, even back when I wasn’t a pretend grown up, I liked this cake. 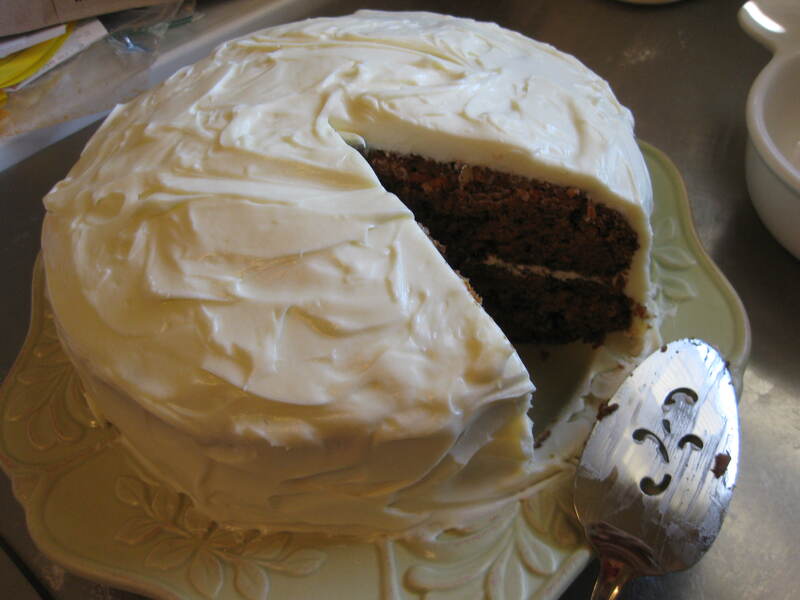 It was the first carrot cake I ever baked, and the first one I ever liked. I got the recipe from a novel by Meg Cabot, Boy Meets Girl. It’s an interesting book, written all in emails and notes and recipes, but I guess we’re not here to talk about the book. After I saw this recipe, I couldn’t get it out of my mind. So I borrowed my Aunt D’s mini chopper to grate some carrots, mom bought me the cake pans I needed, and I set out to make this cake. It was an instant success. I really liked it, I mean, cream cheese frosting where had you been all my life?!? My mom really liked it, too, becoming the requested cake to celebrate her birthday. Everyone else who tried it liked it as well. And before I even really ventured too far into the world of baking (it’s still not my most comfortable cooking genre), it was the only cake I had ever made. When we decided to have a dessert table for our wedding rather than just one cake, I knew we still needed to have a single cake to cut. I didn’t have to twist Chris’s arm too far to have him agree to this one (he’d already tried it more than a couple of times). Our dear friend Amy (hi Amy!) made us 3 of these for our wedding reception. They were beautiful, delightful, looked great in the pictures and most importantly? Tasted divine. We included the recipe on the recipe cards we gave out at our wedding. And repeated serving it when we went to celebrate our marriage with some NY friends and family a little later. It went over quite well, with someone even going home that day to give it a try in her own kitchen. So what makes this recipe so good? I’m not sure. It’s super moist, due in large part to the applesauce I think. It’s also not overly spiced, which I appreciate. I only like cinnamon in small doses, and to me, nutmeg, allspice or cloves are overkill in a carrot cake. The frosting has a bit more of a tang thanks to the lemon juice than a lot of cream cheese frostings I’ve used, which helps to balance out the sweetness. But even better than that, it’s not terribly fussy. I mean, it’s a cake, yes, but as far as cakes go, I’m sure you could take a lot of shortcuts here and there and it’d still be great. We’ve made this same recipe as one larger cake in a 9×13 pan and it was just as good, less fussy, and goes a little further for guests. Just bake it a bit longer until a toothpick in the center just comes out clean. Don’t get too fussy when you’re frosting, or else you’ll end up with crumbs since the cake is so moist. It still tastes delightful, but just doesn’t look quite as pretty. We generally mix the batter by hand and do the frosting with a hand mixer, though I’ve used both techniques on each part before. For some reason I’ve not tried our stand mixer for any of it, but I think it’d work just fine. Try not to let the cake get overdone on the edges. This time I made it I did just that, and while tasty, the texture isn’t quite as good. Sifting. In this case you measure the flour using the scoop and sweep method and then sift it. Not to be confused with sifting first, which can change your batter quite a bit. Carrots. One small bag of California carrots oughta do you, but you won’t use all of them. I think usually it’s about two medium carrots to get a cup, but I always just guesstimate and it turns out fine. We’ve used the fancy bunch carrots with the greens still attached, and needed two bunches. It was good, but not noticeably better with those so we usually stick to the cheaper ones. Heat oven to 350 degrees. Butter and flour two 9-inch cakes pans. In a separate, larger bowl, combine canola oil and sugar. Add three eggs and then the dry ingredients. Mix just a bit to start breaking up the egg yolks and incorporating the dry ingredients. Squeeze carrots to remove excess juice (we use paper towels, but cheese cloth works). Add those, along with the applesauce and walnuts to the rest of the ingredients. Mix on low speed or by hand until just incorporated. 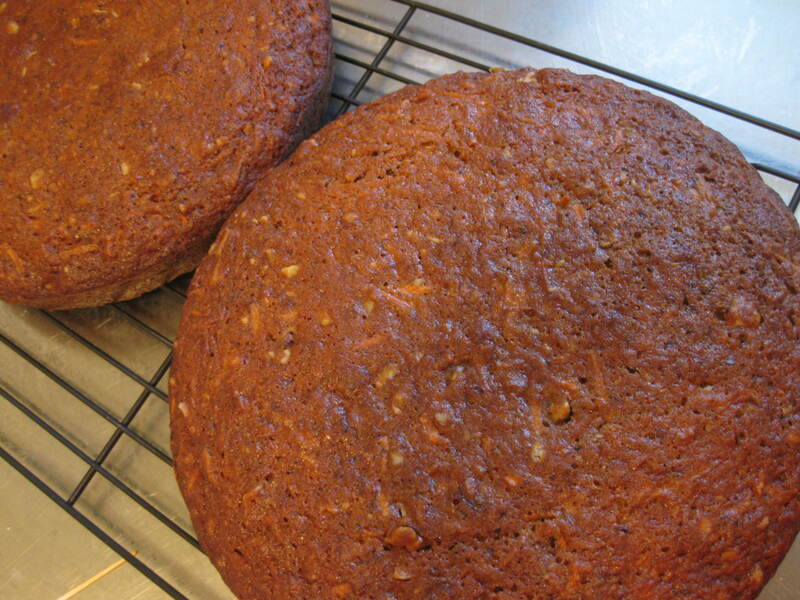 Divide batter into two pans 9 inch round cake pans and bake 40-50 minutes, turning ¼ turn every 15 minutes. Add sugar gradually and beat until almost smooth. Finally add the lemon juice to taste and vanilla. Beat until smooth and creamy. When cakes are cool, place one layer on a plate or cake stand top down. Spread about 1/3 of the frosting on the first layer to the edges. Place the second layer on top of the frosting, bottom side down. Frost the top and edges.